Thanks you for a great field season! Our 2015 summer staff Karl, Jennifer, and Sam. The ALRF will be acting on behalf of UNBC Facilities to remove trees that have been identified as dangerous. These trees are standing dead, diseased, or have otherwise been identified as unstable and could fall causing injury or property damage. June 8 and 10 crews will be operating around campus to selectively remove these trees. many of the trees will be chipped and the chips will be used at the BioEnergy plant here on campus. A number of these trees pre-date the campus construction and unfortunately are now over-mature and the tops are dying. A number of these trees must be selectively removed for safety reasons. There are a number of younger trees which will maintain a stand of trees in this location – when these reach the end of their days there is another cohort already filling in behind them. Some of the branches may be mulched and broadcast on site. The larger pieces will be chipped and ‘recycled’ as heat through the Bioenergy plant. The very large spruce tree near the south entrance to the Administration Building is due for an assessment, and quite possibly will have to be removed this spring. It has been monitored for the past several years and unfortunately the top die-back has been advancing and there is now a significant danger both to persons and the building. 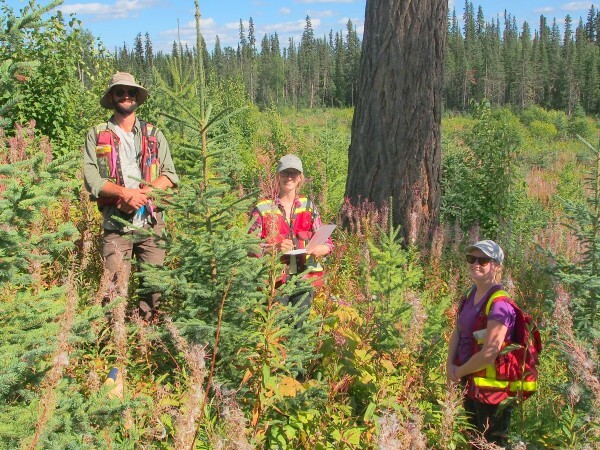 Much thanks to UNBC’s Green Fund and GIS lab. It is through their assistance that we were able to initiate the #mapUNBC project! This mapping project highlights UNBC’s Forest Lands surrounding the main Prince George campus. There are more than 500 ha of forested lands and more than 21 kilometers of trails on UNBC Property! For more information and to get a copy of the map use the menu or go direct to the #mapUNBC page.